Whatever anyone wants to wear is fine. Sure, perhaps cargo shorts have been deemed uncool via data science, leading to the conviction that they are an objectively, quantifiably bad thing to wear. But listen: If you like cargo shorts, and they provide pockets for you in a way that is convenient and comfortable and allows you to happily go about your business in life, then by all means, please wear cargo shorts. The same is true of any other article of clothing: They’re all fine, if they make you happy. The RompHim has a Kickstarter that has already soared past its goal of $10,000 with four weeks still to go, meaning there is no space for us to fight this. The RompHim is happening; it is an inevitability, as certain a fixture of our future as the changing of the seasons. 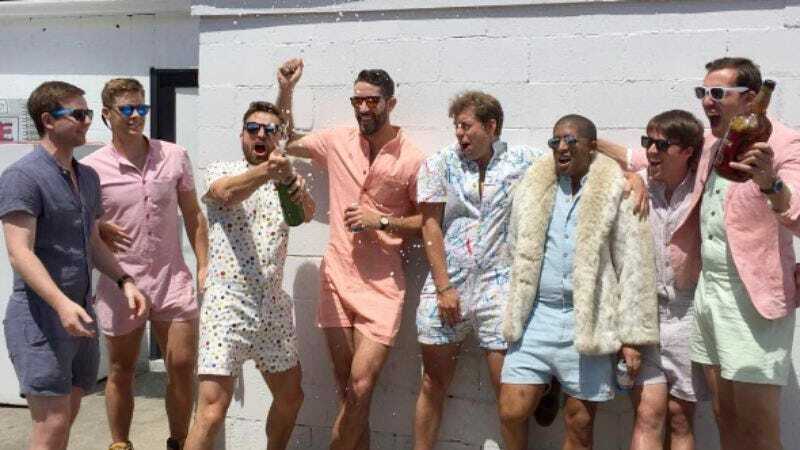 And as those seasons change, the bros will emerge for their Sunday Fundays and yard sports in paint-speckled and pastel coveralls, tailored as if to accentuate the wearers’ ballsack. We will see these ballsacks in the wild. At least now we know what the stereotypical douches of our era will be wearing.